The benefits of flat locking rods in electrical/electronic cabinets can be readily seen in their ease of fitment, so we are delighted with this new roller shoe for its smooth operation and quick installation to standard 3mm x 14mm rods. The new Program 1121 guide shoe features a long lead-in ramp and integral roller which minimise locking force required in multi-point locking on larger cabinets. 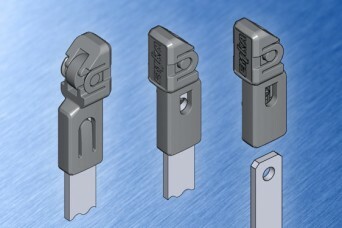 The flat rod system also enables positive registration and location in a tool-less fitment which thus provides a quick installation to compliment the smooth operation when in-situ. Share the post "Roller Shoe for Flat Locking Rods"